The quickest definition: A sticky website encourages the reader to stay and look around. It does this by minimizing ads, click-able feeds from social media platforms like Facebook and Instagram, badges that link to other sites, quiz results that link to other sites, etc. In other words, it doesn’t have a bunch of links and images that lead the reader away. Instead, a sticky website includes many options to click around within the site. Things like related articles, interesting pages to explore, or even “ads” for whatever the website is offering. A sticky website is clearly a good thing. And it comes with two bonuses. 1. Search engines give preference to websites that are stickier. They track how long users stay on a site after finding it through organic search results. The longer people stay on your site, the more search engines like you. 2. Feeds from sites like Instagram, Facebook and Pinterest slow down your page load time. So, the fewer…the better. Does this mean you have to remove every link that leads to other websites? Nope. Just think about each one carefully and only include those that benefit you and your reader. I can tell you that this has been a tough habit for me to break. I still keep a Pinterest feed in my sidebar because I just love the images. We’re all just doing our best, right? Anyone else working on this or have you got it down cold already? Hey Nicole! What are your stats for good “stickage” 😉 I think I tend to average around 3-5 minutes…is that good? bad? meh? I don’t have any feeds other than social media trackers on my site and blog, so maybe that is good for SEO although I do like the idea of a pinterest feed! That image is the best! I wish more people would listen and de-clutter their sites – especially if it’s a business site. Hey… I think my website IS sticky (mostly out of sheer laziness and lack of technical know-how). I’m doing something right! Love the illustration, Nicole! 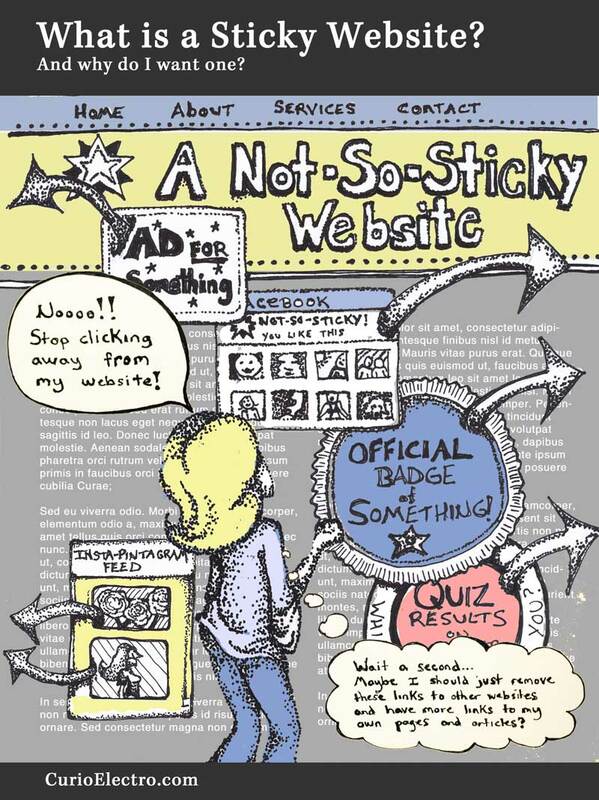 I was on your website today reading your (funny funny) blog post and it IS totally 100% sticky! Quite an interesting short post. Not related to the post, I have a compliment to give. AWESOME LOGO hahahaha. It is quite interesting and a little funky and gives a weird feeling (in a good way). Thanks for sharing this post. Have an awesome day. Thank you so much, Sriteja! You know those times that you create something in like ten minutes and somehow it completely works for you? This logo design was one of those rare times. I’ve evolved it slightly over the last few years, but the mechanical horse image remains exactly the same. Your compliment means A LOT. I didn’t know there was a term for this, but I think I instinctively try to minimise to many distractions and external links away from the content. Very useful to know what it is called and also the SEO benefits! That’s fabulous. You’re instinctively sticky! Such a great post, Nicole! I think getting rid of those stickiness-damaging outbound links is particularly challenging for those of use who’ve been in the blogosphere since the “Dooce is radical” era when blogrolls and merit badge memes were a way to build community. Ah, those innocent days! I must admit, I kinda miss them but I completely agree with your position and have (mostly) broken my bad habits on this front. I was just discussing blogrolls with someone this week! And I actually almost put one into the image. I know exactly what you’re saying. I had a blog back in 2006 and this NEVER would have occurred to me. Actually, I would have felt like I was being a jerk. But time does march on, doesn’t it? :) It makes me wonder what we’ll be doing in 2016. Probably looking back at what we’re doing now and thinking it’s ridiculous. I was just trying to decide if I add more things to my website site such as a Facebook like box and Instagram stream. I think I will just keep things simple for now and try to have a sticky website! That’s great, Jocelyn! And one less decision to be made. Which is nice. What a fab graphic ~ pinned & tweeted it. I never thought of the term Sticky relating to getting people to stay on your website, but I understand and teach the concept myself. Cleaner with less clutter also makes it a less visually stressful experience for your visitor too. Like going to a restaurant and you can’t decide between the 12 amazing things on the entree menu. Excellent point, Angelique. All of that stuff is also a visual distraction. So true. Oh wow, thanks for these great tips! I finally launched my [unfinished] personal blog yesterday. I’ll definitely keep this in mind as I continue to make design changes. Congratulations on launching your blog! You’ll be making design changes forever:) It’s fun. Now you’ve got me thinking. I’m pretty sure my business site is on the stickier side, but I plan on paying more attention to what will keep people on my site. Thanks for your thoughts on this interesting topic!